Which ever good ol’boy it was who first bawled the phrase ‘There ain’t no replacement for displacement!’ way back when – almost certainly from beneath the wide brim of a Stetson, rye whiskey held aloft – he probably had a point at the time. If you wanted to go faster, you needed more cubes. But in the age of smartphones and cryptocurrencies, it’s a bit of a quaint notion. There are, after all, countless other ways of making a car shift along more quickly, such as hybridisation and turbocharging, or perhaps using clever lightweight materials so that what displacement you do have can work a lot harder. And yet, there really is no replacement for displacement. Nothing else comes close to the soaring soundtrack of a great big atmospheric engine, and nothing matches the frantic power delivery – the kind that makes you screw your face into a tight ball – that you get from six or eight big unassisted pistons pounding up and down. You just can’t beat it. But in the affordable performance car sector, those high-capacity, naturally aspirated engines have more or less disappeared recently, done for one by one by relentlessly punitive emissions regulations. Everything’s got a turbocharger on it these days. Well, not quite everything: there is still the good ol’ American muscle car. The latest Ford Mustang is a global car, which means you can have it in right-hand drive. It even has European-style multi-link rear suspension, rather than a live rear axle. The sixth-generation Chevrolet Camaro, meanwhile, is close to 100kg lighter than the version it replaces and it too uses a more sophisticated multi-link rear end. In some very important ways, then, the latest breed of American muscle car has been dragged into the 21st century. In one crucial department, though, the Mustang and the Camaro are still deliberately and deliciously old-school: both have heaving great V8s that make their power through glorious old displacement alone, with not a turbocharger or electric motor in sight. The Ford’s measures 4951cc, the Chevrolet’s even bigger at 6162cc. That’s all well and good. Yes, they’re relatively modern cars these days, just with old-style V8 engines, but let’s be realistic about this: you wouldn’t actually consider owning one in the UK, would you? 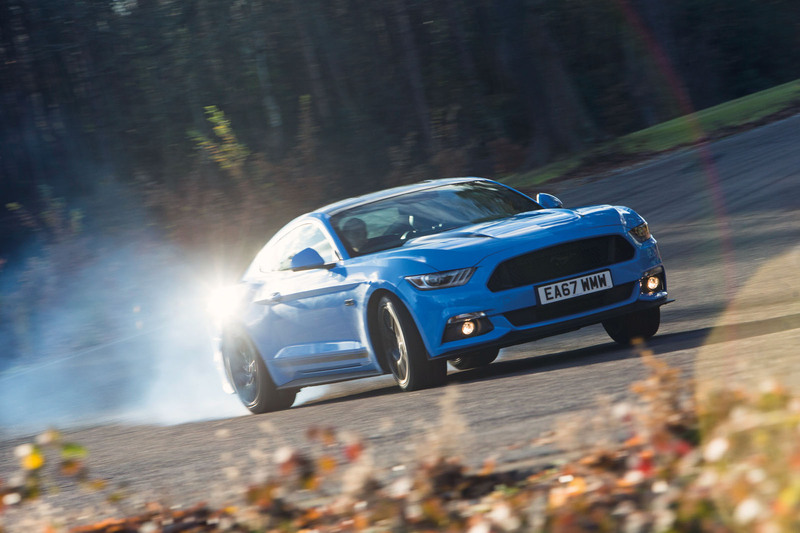 It’s easier to make a case for the £38,095 Mustang now than ever before, and although the Camaro, which is a fraction more expensive at £39,040, remains left-hand drive only, it is now being sold here by an official dealer, Surrey-based Ian Allan Motors. If you’ve ever felt that muscle car itch, there’s never been a better time to scratch it. You could drive the Camaro every day for a year in the UK and be pretty damn sure of never seeing another one. Just as Ford did with the Mustang – and like Dodge managed with its Challenger – Chevrolet has brilliantly reimagined the overall aesthetic of the original Camaro in this latest model. It looks right up to date, but it’s still unmistakably a Camaro. Aside from their big V8s, American muscle cars have always been characterised by one other thing: completely shonky interiors. It’s been part of the trade-off. You put up with scratchy plastics and shoddy build quality because the list price was so modest and there was a whacking great V8 up front. That’s still very true of the Mustang. Its cabin is fit for purpose but the materials are unimpressive and the dashboard design is slavish to the 1960s original to the point of pastiche. It’s all just a bit tacky. 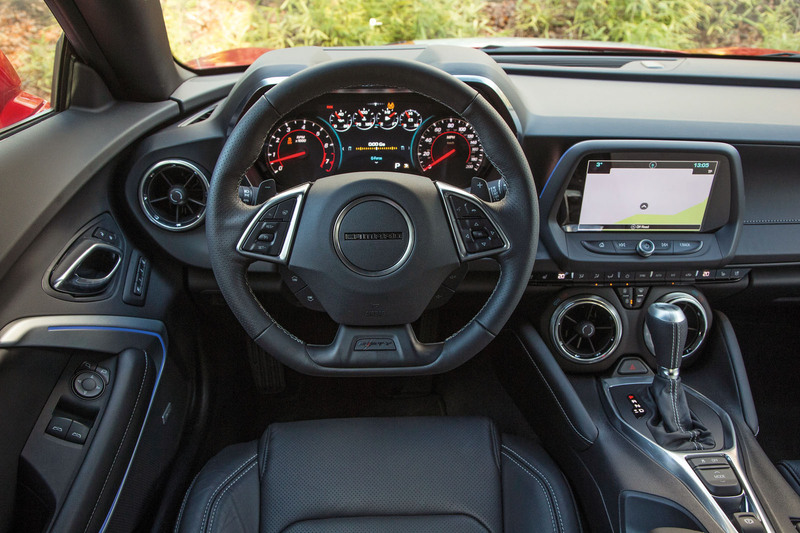 The Camaro, meanwhile – in what must be a first for this sort of machine – feels like a premium car from within. The material quality is much better and the design is clean and simple. There are elegant flourishes too, like the low-set central air vents that double up as heater controls. 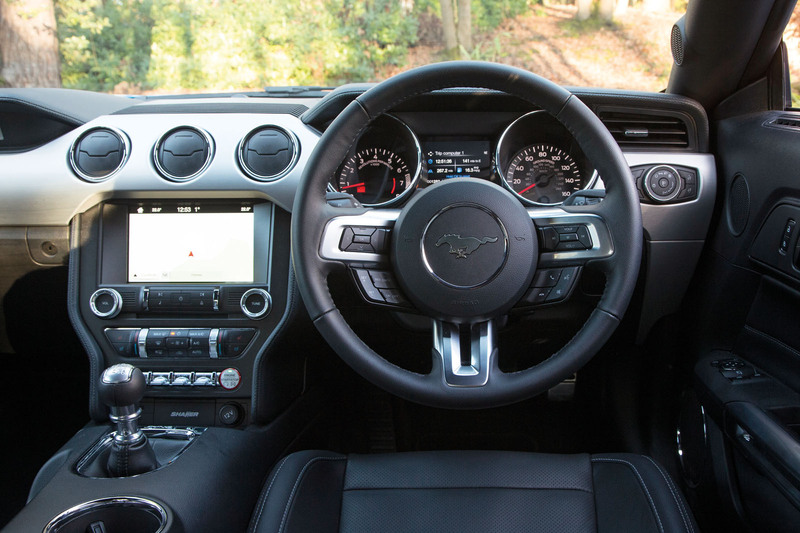 Overall, it’s a more pleasant environment, although it should be acknowledged that the Mustang’s steering wheel does reach out a lot further, giving a more natural seating position. As far as the steering itself goes, though, it’s the Camaro’s that feels better. It does initially, anyway. Whereas the Mustang’s helm is quite vague and imprecise at first, the Camaro’s is tight, quick and very direct, making the car seem lighter and smaller. But when you start to really lean on the Chevy’s front axle in corners, you realise that the heightened rate of the rack is a bit of an artifice because, although the front end does keep up with it, the rest of the chassis doesn’t. What you feel from behind the wheel is the front axle darting hurriedly into a bend, then the car tripping over itself as it struggles to haul its 1659kg mass into the corner. That makes the Camaro feel just a touch clumsy. Ford’s engineers, by comparison, seem to have been bold enough to allow the Mustang to behave like a muscle car. They haven’t tried to make it feel more athletic than it really is. So although its steering is quite loose to begin with, it is actually better matched to the rest of the chassis. Once the two cars are loaded up mid-corner, it’s the Ford that’s the easier car to read too, the one that gives you a clearer idea of what’s going on down below. 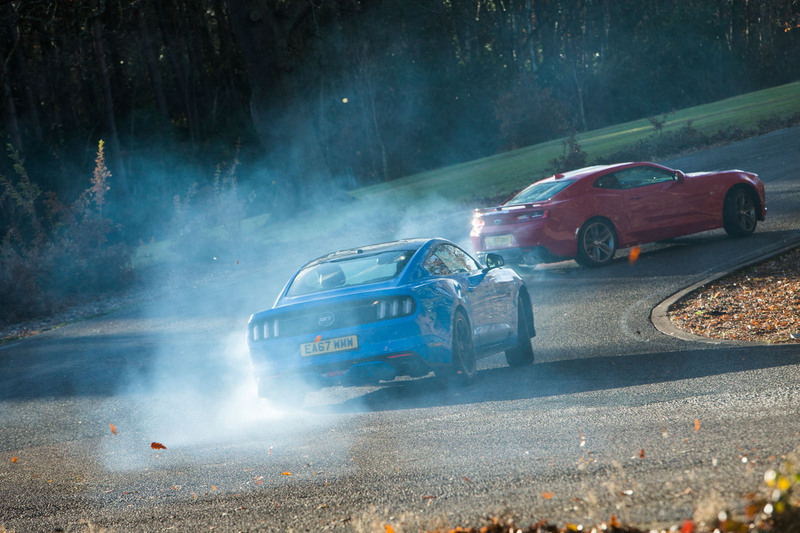 You feel just a little more empowered to drive the Mustang right up to the limit of grip. Both cars may well be more modern now with their multi-link rear suspension arrangements, but both still feel completely different to any European four-seat coupé, both still with a definite American flavour. They take up a lot of road and, rather than being darty and lithe, they’re both somewhat relaxed and sedate. They move to the rhythm of air raid sirens. You don’t try to really hustle them along a road, then, but instead stroke them along at good speed, pouring them smoothly into bends. The Mustang is a global car but still most at home on the kind of wide, endlessly long and arrow-straight roads that demand a long-legged gait and fluid, rangy suspension. The kind of road, frankly, that we don’t have a great deal of here in the UK. Our back roads tend to be tight and twisty with three-dimensional surfaces. Aside from feeling quite sizeable, then, both cars also feel very busy, rising and falling markedly with the road surface and bouncing a little on their springs, getting heavy in compressions and very light over crests. Of the two, though, it’s the Camaro – at least with this test car’s optional magnetic dampers – that has the tauter body control. So they still drive like American muscle cars. That’s the point, really, and don’t think for a moment they aren’t fun or entertaining because of it. But the Mustang and the Camaro are really only about one thing: their wholesome V8s. Being a good chunk bigger than the Ford’s engine, the Chevrolet’s motor is more powerful, producing 447bhp and 455lb ft versus 416bhp and 391lb ft. But what’s so much more important than sheer grunt alone is character and soundtrack. The Camaro’s engine is unmistakably a V8, warbling into life in a way only eight cylinders in a vee can and pulling all the way to the 6500rpm redline with a wonderfully hard-edged and off-beat rumble. The Mustang’s engine delivers much the same effortless, torque-rich performance as the Camaro’s, but – criminally – it does so without a great deal of character. The soundtrack is bland by comparison, all wind rush like a hairdryer rather than being tuneful in any way, and beyond 6000rpm the engine wilts miserably. Perhaps it was the Camaro’s optional sports exhaust that made the difference, and perhaps an uprated set of pipes would be all it’d take to enliven the Mustang. Whatever, the Chevrolet’s more characterful V8 counts for so much in a type of car that trades entirely on the strength of its character. But here’s a quandary: does the Camaro’s more seductive engine outweigh the inconvenience of driving a left-hand-drive car? Maybe the novelty of its roaring soundtrack and ferocious top-end would diminish with every unsighted junction, every dicey overtake and every out-of-reach ticket machine if you used the car every day. But if you kept the Camaro as a weekend plaything, sitting over on the wrong side might even be part of its charm. The Ford certainly isn’t without its appeal, but there is more to enjoy about the Chevy. 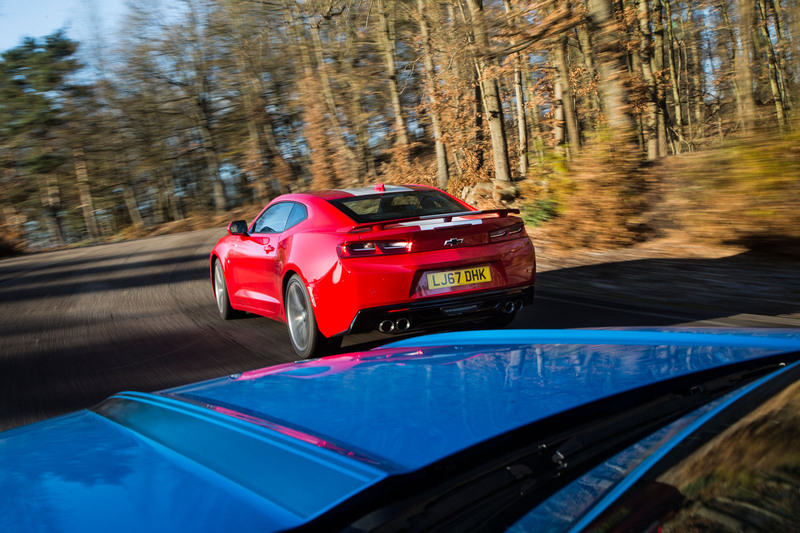 And although there are plenty of European coupés much better suited to UK roads, the Camaro proves once and for all that for soundtrack, drama and good ol’ boneheaded giggles, there’s still no replacement for displacement. 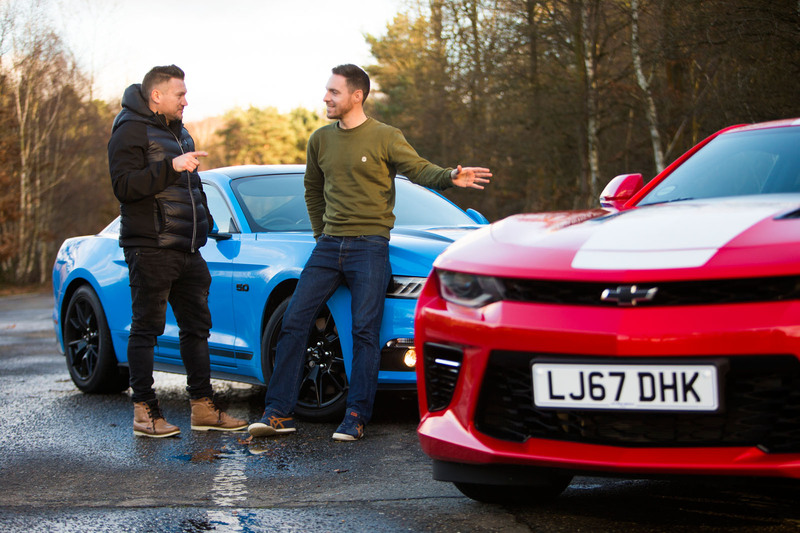 1st - With a more characterful engine and a higher-rent cabin than the Mustang, the Camaro is our muscle car of choice. 2nd - Fun to drive and great to look at, but the cabin feels cheap and the engine lacks the Camaro V8’s drama and soundtrack. In the car world, rivalries don’t get much more bitter than Ford versus Chevrolet. The two automotive giants have been at war for decades, most notably in the pick-up truck and muscle car sectors. The latter conflict has waged since 1966, when Chevrolet first introduced the Camaro as its response to Ford’s genre-defining Mustang. In the battle for sales, the Blue Oval has more often than not had its nose in front. As of 2014, the Mustang had outsold the Camaro in 31 of the 41 years that both cars had been on sale. In 2017, Ford sold 81,866 Mustangs in the US compared with Chevrolet’s 67,940 Camaros. But the Mustang versus Camaro conflict is about so much more than just sales figures. It’s a rivalry that’s so deeply ingrained in US popular culture that, for most people, it would be unthinkable to change allegiance from one to another, just as an English football fan would never dream of switching his support from Liverpool to Manchester United. 1967 FORD SHELBY MUSTANG GT500 - Ford teamed up with legendary tuner Carroll Shelby in 1967 to produce the Shelby Mustang GT500. Equipped with a 7-litre V8, 2048 examples were built. Expect to pay £100,000 today. 1969 CHEVROLET CAMARO ZL-1 - Like the GT500, the Camaro ZL-1 was fitted with a 7-litre V8, but, unlike the relatively common Ford, just 69 were sold. They’re highly sought after today, commanding up to £700,000. Nice as the sound drive even, for Uk Roads they occupy too much Road space, the Yanks have never produced a medium sized Car that has been a success other than in the USA....! And yet they only slighty longer and a fair bit narrower than a Merc GT or slighty longer and wider than an Audi A5. The latter particularly never panned as too big for the UK. The 1970's called and wants its stereotype back. I presume you think Lancia's rust etc. We clambered for decades to get the Mustang in RHD,and yet, when it did not a lot were bought or at least where I live I have seen only two or three?, maybe there’s more in the Cities I guess? ....they are a common site in Hampshire and Surrey....Mustangs everywhere- usually the full-fat example (thank god). Hi. Since when did the Camero, become a Camaro? When has it ever been s Camero? The car is calked a Camaro. It even has a badge to tell you. When has it ever been called a Camero? The car is called a Camaro. It even has a badge to tell you.